What is an iTero scanner & how can they improve our service to our patients? iTero intraoral scanners help you see your new smile before you even begin treatment. We can create a 3D image of your teeth in just a few minutes using an iTero scanner. We then have a high-resolution, interactive 3D image of your teeth which allows quicker treatment planning for the doctor and an opportunity for you to view your new smile “on-screen” prior to commencing treatment. Intraoral scanners are simple to use and are operated mainly by our dental assistants. They also help our doctors diagnose orthodontic problems and develop the best treatment plans. Using a small wand, the operator moves around a patient’s mouth “scanning” as it goes. The wand captures thousands of images per second which are pieced together to create a 3D visualisation of a patient’s mouth. These wands are small enough to scan molars in the back of the mouth. With these small wands we are not limited by how wide our patients can open their mouths, and they are less likely to make patients gag than older forms of scanning technology. 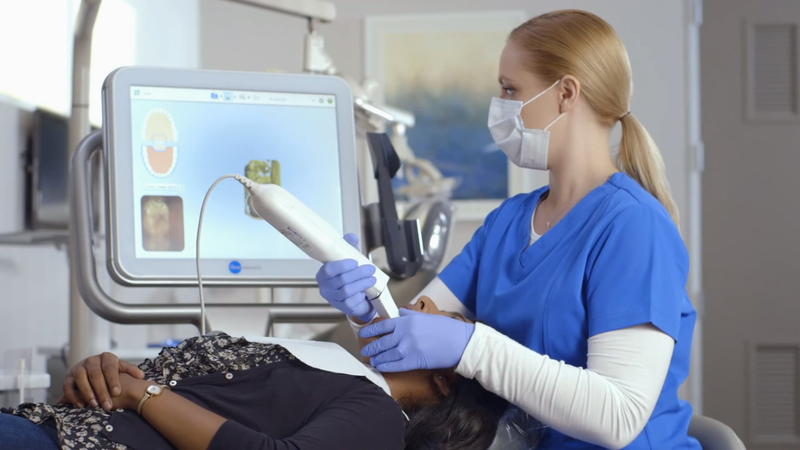 iTero intraoral scanners have screens which display the dental images as they’ve captured. These screens show whether the scan is good or not, before it is saved and submitted to the laboratory for manufacture. Unlike many intraoral scanners, we don’t need to cover our patients’ teeth in any powders or substances before commencing an iTero intraoral scan. This benefit improves the scanning comfort for our patients and allows for shorter scanning appointments. patients can then understand the expected result which gives them more confidence in their diagnosis and treatment plan. iTero ClinCheck treatment plans are usually posted to the Invisalign® Doctor Site three times faster than traditional scans. As a result, our patients’ Invisalign® aligners are produced and sent back to our practice sooner so that they can start treatment earlier. Our doctors can create superior Invisalign® treatment plans for our patients using iTero intraoral scans. Align Technology research shows orthodontic practices that use the scans have 10 times fewer rejections and seven times fewer issues with the fit of the Invisalign® aligners. Regular scans throughout Invisalign® treatment assist our doctors in comparing expected outcomes with the actual results. If results aren’t as expected, our doctors can use the scans to educate our patients about their treatment and the importance of complying with their recommendations.